Minhaj Ul Qadri Chief Dr Tahir Ul Qadri was making big statements until yesterday that time of this Government is over and we will not return to home until this Government fells but his tune completely changed on Thursday and he announced to end the Dharna after doing talks for 5 hours with 10 leaders of coalition Government. Tahir Ul Qadri claimed while addressing the gathering after talks that our demands are accepted regarding organizing free and fair elections. Agreement got signed between Government and Tahir Ul Qadri after which Dharna was ended on Thursday night. But the question here is that will this Government really follow the agreement done with Tahir Ul Qadri? Zardari is the same person who once said that Agreements are not Quran and Hadith that we follow them. 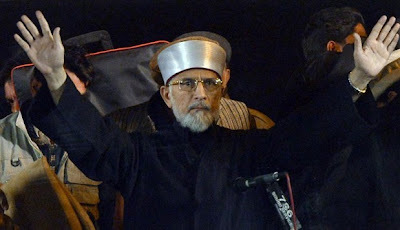 Its clear that Movement of Tahir Ul Qadri has failed because he ended it on wrong time. He should have not started it or not ended it in the middle way. His struggle for so many days will result in nothing now.